It all started one day after I opened a Baby Bertha kit and found that the motor mount had the wrong size adaptor rings. The rings were for a BT-50 and not a BT-20. I thought about replacing the rings with a correct set, but then the creative juices started to flow, what could I do with this kit? I had always wanted to build a Big Bertha but had never purchased the kit. With the parts in the Baby Bertha, I could substitute a longer body tube and build the Big Bertha with a 24mm motor mount. But that had already been done and besides, I'm cheap. I like the less expensive motors. So that still left the question, what else could I do? What about a boat tail to make the Big Bertha just slightly more aerodynamic? And how about a baffle so I could eliminate wadding? So what I ended up with is a Baffled-Boat-Tailed-Bigger-Baby-Bertha. This kit bash uses a Baby Bertha as a starting point but a Big Bertha could be used as well. The first item was to make the boat tail and the baffle assembly. The motor mount/baffle consists of a standard length BT-20 motor mount tube that has three centering rings on it that will take it to a BT-50 size. 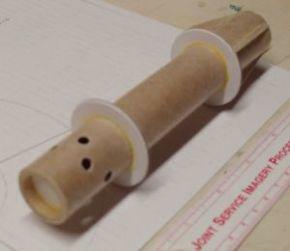 This fits inside a longer BT-50 tube. The BT-50 tube is 8 inches long and slides down even to the aft end of the BT-20 motor mount. The opposite end is plugged with a centering ring and cardboard disk that is coated with epoxy on the inside to protect it from the ejection gas particles. There are 8 holes spaced around the top sides of the BT-50 tube, this allows the hot particles to hit the end cap and allows the hot gas to escape through the holes to pressurize the upper body tube and deploy the parachute. The lower BT-50 to BT-60 centering ring is glued 2 1/8" up from the aft end of the mount. On this aft end, four triangular balsa supports are glued to support the paper boat tail and the fins when they are attached later. These supports have an 1/8" section that is square and fits under the outer body tube. The motor mount is then glued into the body tube and the body tube is then marked as to where the fin supports are located. 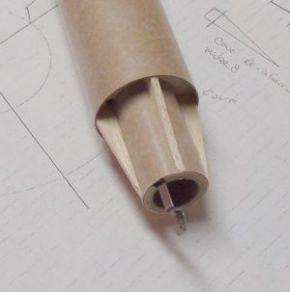 I made a paper reducer for the boat tail the old fashioned way using a compass and calculations that I found in a book. I used two of these paper shrouds on top of each other to stiffen them up. I then coated the paper with Crazy Glue. After the shrouds are in place and dry, I added the fins with little triangular pieces of balsa on the ends to match the angle of the boat tail. The shock cord was mounted with a standard tri-fold paper mount. I painted the rocket in a basic black and modified the stickers that came with the Baby Bertha, to read, "BBertha". The first flight was on a B6-4 on a beautiful day with no wind. I used a 12" parachute for recovery. The rocket had a great flight with ejection shortly after apogee, but it broke a fin on landing. It needs a bigger parachute. Back to the shop for a repair. This time I noticed that the fins were not adhering to the boat tail well. It seems that the Crazy Glue on the boat tail did not allow the yellow glue that was attaching the fins to get a really good "bite". I then cleaned off the fins, sanded the tube well to rough it up, and "drilled" a set of holes with "ye olde #11 X-Acto drill" so that the glue would seep into the main body tube and form "rivets" to hold the fins on stronger. During this process I decided to replace the fin that was split in two and repaint the lower part of the rocket. Now that all that was completed, it was back out to launch it the next month. Again I loaded an 18" parachute and a C6-5 into the Bertha. The wind was slightly stronger this time and the rocket weathercocked into the wind then straightened out. Ejection was at apogee and the parachute deployed properly. The rocket lightly touched down with all fins intact. Third time was a charm! Finally a successful flight! The Baffled-Boat-Tailed-Bigger-Baby-Bertha was an interesting exercise in problem solving and design and has produced a fun rocket. Now to drag race my son's stock Big Bertha and see who goes higher. Anyone care to take a guess who's will go higher?